Years ago, SOLE began a journey down a new sustainable path, committing themselves to providing quality orthopedic products without sacrificing the environment. The vision—to pioneer a closed-loop manufacturing process by reusing natural wine corks, a sustainable and renewable resource that had been underutilized in the past. 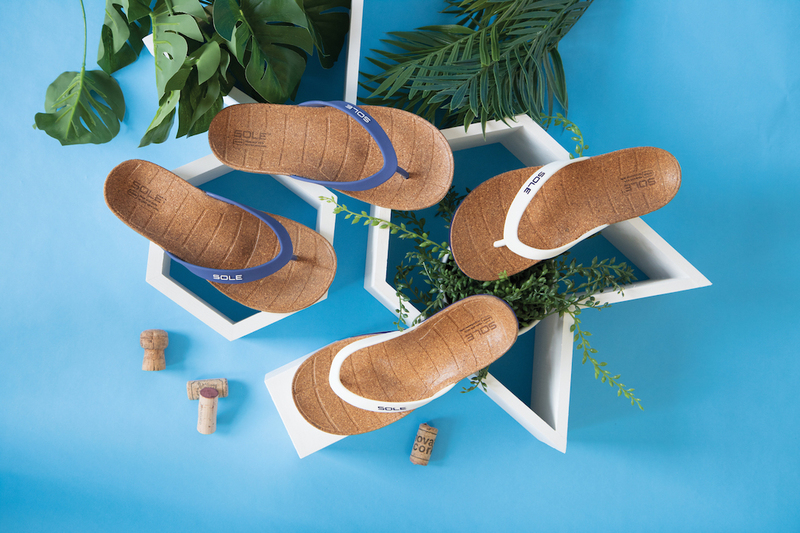 SOLE launches brand-new Beach Flips, a collection of modern, affordable splash-friendly sandals that are made with 100% recycled wine corks. SOLE’s Beach Flips boast a metatarsal pad, an anatomical shape for natural toe splay and an orthopedic fit that wear molds to one’s feet and improve foot health, balance, posture, and stability. With bright seasonal colors, lightweight and versatile style and SOLE’s lowest price point for orthopedic footwear yet, these sandals are going to become this season’s staple item. Priced at $60 USD. Available Spring 2018 at yoursole.com. Elegant and comfortable, SOLE introduces the Casual Flip, a splash-resistant sandal featuring a canvas upper and firm footbed made of 100% recycled wine corks. This line is wear moldable and boasts a metatarsal pad and anatomical shape for natural toe splay. Provides enduring comfort throughout the day and a refined style that can be dressed up or down. Priced at $80 USD. Available Spring 2018 at yoursole.com. A returning favorite, the classic Sport Flip is comfortable, versatile and water friendly. Wear them to the beach, pool, park or around the house. Featuring an anatomical shape to allow natural toe splay, wear-moldable EVA footbed, dynamic metatarsal support, and cushioned synthetic straps with an ultra-soft polyester liner, these Sport Flips offer customized comfort for the everyday wanderer. Priced at $70 USD. Available Spring 2018 at yoursole.com. Ideal post-activity or recovery footwear, this water-friendly slide is great for the locker room, the pool, the beach and anywhere in between. Featuring an anatomical shape to allow natural toe splay, wear-moldable EVA footbed, dynamic metatarsal support and an accommodative one-piece upper with built-in stretch that keeps your foot comfortably in place. Priced at $70 USD. Available Spring 2018 at yoursole.com. SOLE established itself as a leader in pain reduction and orthopedic health thanks to its award-winning customizable footbeds. SOLE’s signature shape has been proven time and again to eradicate foot pain, fatigue and prevent injury while improving orthopedic alignment issues, athletic performance, posture, and foot and ankle mechanics. SOLE’s dynamic support reduces strain put on vulnerable parts of the foot. The supportive high arch, metatarsal pad, and deep heel cup promote the foot’s natural alignment and drastically reduce discomfort caused by plantar fasciitis and other common orthopedic conditions. ReCORK is sponsored by SOLE and is North America’s largest natural cork recycling initiative. ReCORK gives wine corks new life in the form of footwear and other upcycled products. The ReCORK initiative is based in the US and has over 3,000 collection partners. Learn more at recork.org.